47-19. Okay, so I'm not perfect...this we know. Upset Saturday destroyed my week three predictions, because - well...they weren't the upsets I predicted (I hate when that happens!). Someone explain what would happen to me if I predicted Oklahoma State to lose to TROY, or Navy to drop a home game to BALL STATE - or even better, TCU losing to AIR FORCE!!!! The Football Gods were out to get me after going 54-8 in week two and bragging about it. I did get a few tough calls, like KENTUCKY over Louisville, Arkansas St. beating SMU and Southern Miss getting a road win at ECU. Still, it was a bad week for a picking power like me and I plan on rebounding nicely. Overall Record for 2007-08 season: 154-44. Slumps are not an option, so as any good college football player - I have a short memory. It's time to move on to week four and destroy the competition on OFF PROMPTER!!! It's time to make history in week four!!!!! ATLANTIC COAST CONFERENCE: 7-3 last week, 25-5 overall in this league. *Tough call!!! The 'Canes defense at home should be nasty, but A&M simply has too much firepower. RB Michael Goodson had 113 yards on 11 carries last week, RB Javorskie Lane has 7 touchdowns through three games and QB Stephen McGee is battling QB Chase Daniel (Mizzou) and QB Sam Bradford (OU) for Big 12 Player of the Year honors so far. History is also on the Aggies side, considering the only time these two football powers played was 1944 and A&M won 70-14!!!! Don't forget Miami's dominance on Thursday nights though...the Hurricanes are 9-0 on Thursdays dating back to 2000. Expect Miami to lead at the half and Stephen McGee to take over with his arm and legs in the second. *Uh-oh...Butch Davis is dealing with a three-game losing streak! Carolina simply doesn't have an established ground game to help keep its' defense off the field. The talent is in place for a solid, young, defensive squad - but with T.J. Yates chucking the rock 40 times a game the Tar Heel tacklers are running out of gas. Expect QB Matt Grothe to work his magic once again as the RANKED Bulls come close to duplicating last year's 37-20 victory. 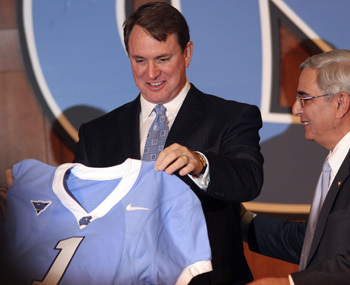 *When Tom O'Brien took over at N.C. State, he drooled over the Wolfpack's schedule. First four of five at home, with the only road game being at Boston College - his old stomping grounds. He probably thought in the back of his mind he could run the table and head into Florida State 5-0, ranked and the talk of college football. Now, he's irrelevant. Clemson, on the other hand isn't a very good road team (5-10 in last 15 ACC road games). They are very good at running ball against N.C. State and with James Davis and C.J. Spiller getting help from QB Cullen Harper in stretching the field - the Tigers will pick up their first road win of the year. *Had to think about this one...for awhile. After getting burned last week (B.C. made Tech look bad) by both the Yellowjackets AND Cavaliers (because they won) I didn't have a good feel on the "vibe" of this game. Then I went back to my "Pick'em Handbook" and reminded myself to keep it simple. Who CARES if Virginia is on a two-game winning streak? It's still Virginia and their offense will NOT manage more than 14 points against a very good Georgia Tech defense. RB Tashard Choice has something to prove after being held to just 31 yards on 15 carries last week. *QB Matt Ryan is generating Heisman Hype in Chestnut Hill and for good reason. His performance last week on the road against a tough Georgia Tech defense was amazing. Throw in the ridiculous schedule for the Eagles (opening up against conference foes Wake and N.C. State BEFORE Georgia Tech) and it's even more impressive how well they've played under first year head coach Jeff Jagodzinkski. Speaking of first year head coaches, Stan Brock is keeping Army extremely competitive so far this season - and for that, he should be commended. Stan will have Army ready to play, but B.C. will be too much and pull away in the second half. *I know! It isn't easy picking Duke games anymore! How in the WORLD did they beat Northwestern last week? I know - QB Thaddeus Lewis. This kid has the athletic ability to enhance the incredible experience (11 starters back) on offense for HC Ted Roof. Here's the bad news for Duke. The Northwestern game was an essential victory for the future of the program. You see, the remaining opponents for Duke all went to a bowl game last year. The Devils best chance at win #2 will be against Notre Dame November 17th. Now THAT is a slap in the face to the Irish. *True freshman QB Tyrod Taylor proved his stock on Saturday, throwing for over 280 yards and running for a touchdown. His athletic ability is in the back of the opposing secondary's mind and because of that alone - he's an upgrade from Sean Glennon. Tyrod continues to cement his place as the starting quarterback in Blacksburg. *Great game! Expect the hometown Deacons to come out strong defensively and shut out the Terps in the first half. Then, Ralph Friedgen's methodical offense gets going and comes back to win the game. Looking at Wake's schedule, a bowl game will be a tall order this year. BIG 12 CONFERENCE: 8-4 last week, 27-9 overall in this league. *HC Todd Graham is on fire right now. After racking up 7 wins last year at Rice and starting off '07 with a sharp 2-0 record including an upset win over BYU, he could be the next great head coach. BUT...Oklahoma is one of the "Big Five" in college football. You know, the upper teir - USC, LSU, Florida, OU and West Virginia. After that handful, it sort of gets suspect. Keeping up with QB Sam Bradford and the vaunted running game of the Sooners will be impossible for the Golden Hurricane. *Okay, so here's a game between two teams I have a hard time predicting. BSU beat Navy against my better judgement and Nebraska did NOT play like a Big 12 power when the Huskers lost to USC. In this game, however - the Cardinals momentum comes to an end...eventually. Ball State will make a game of it - that's a gaurantee! QB Nate Davis is the real deal and BSU has the smallest running weapon in college football. RB MiQuale Lewis is listed at 5'6 - he's smaller than that! Lighting fast though, and will give Husker Nation a scare until Marlon Lucky and the boys come back to life in the second half. *Thanks to USC's thrashing of the Cornhuskers, the Missouri Tigers now look like the best of the Big 12 North. *After coming close against Florida State, the Buffs are beginning to believe in themselves. QB Cody Hawkins is much more than the coaches son and is continuing to improve. As for the Redhawks, it's becoming another long season for HC Shane Montgomery - who's program seems to be declining since his first year in '05. *Yes, the Cowboys will lose yet another game. After looking sooooooo bad against Troy, HC Mike Gundy will have his guys ready in Stillwater - for the first half at least. Texas Tech is back to being a Big 12 sleeper and a 4-0 start has folks in Lubbock pumped! Also, how good is WR Michael Crabtree? This redshirt freshman has 38 catches for 538 yards and 8 TD's!!!!! Hello Heisman!!! If you look at HC Mike Leach's schedule, Tech is one upset away from a 9-3 record this season. As for the Cowboys, the quarterback situation is a mess. *The Bulls are 1-2, with a blowout win over Temple and losses to a pair of top 20 teams. This group is battle-tested and ready to show the hometown crowd something special. Baylor is riding a two-game winning streak and weeks ago I called for Guy Morriss' group to win three in a row. NOW...I'm changing my mind. Baylor had issues with Texas State at home - how are they going to beat a gritty Buffalo team on the road? They're not. Expect Buffalo QB Drew Willy to have an impressive performance. *I almost called the upset of the year!!! I did say UCF would win last week against the Longhorns, but Texas squeeked it out. The ground game for Mack Brown's club did improve and I expect it to blow up against the short-handed Rice defense. 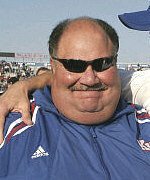 *No synopsis for KU anymore until they play a real opponent. *Fresh off a rival upset victory, I have the Cyclones losing to an 0-3 team! Remember, the Rockets almost beat ISU last year to open the season (lost 45-43 in 3OT) and they are an astounding 20-2 in their first home game after two or more games on the road since 1986! Sounds like an upset special to me!!!! BIG EAST CONFERENCE: 7-0 last week, 21-2 overall in this league. *The Cardinal defense comes back to life against the sour Orange. WR Harry Douglas is going to be a 1st Team All-American on this pace. *It bothers me when "experts" say West Virginia isn't a real contender for the national title. With three players possessing the talent of Pat White, Steve Slaton and Noel Devine - WVU is legit. ECU is an improving program, but if they can't handle Damion Fletcher and Southern Miss, the Pirates don't stand a chance against West Virginia. *The Huskies were my Big East sleeper in the preseason and here they are! Pitt couldn't muster any offense against Michigan State last week and the same issues will hold them back from a home victory this weekend. This is the first "real" game of the season for UConn. Let's face it, Duke, Maine and Temple aren't exactly top 25 talent. Still, HC Randy Edsall knew his guys circled this road contest on their calendars and will bring their A game. Andre Dixon and Ronald Brown will carry the rock at least 55 times between them!!! Remember, the Huskies beat Pitt 46-45 in 2OT last year and deny revenge this weekend!!! *Brian Kelly is doing incredible things in Cincy. Only Troy Calhoun (Air Force) and Nick Saban ('Bama) are doing bigger things in their first year at their respective schools. Marshall is falling apart after losing a second half lead versus West Virginia two weeks ago. BIG TEN CONFERENCE: 7-4 last week, 26-7 overall in this league. *Bill Lynch is 4-0 as HC at Indiana after this home win! QB Kellen Lewis is the second most overlooked player the Big Ten. Only Purdue's QB Curtis Painter deserves more national attention. Lewis was 19-24 passing and rushed for 199 yards last week versus Akron. He reminds me of former Missouri QB Brad Smith (now a WR with NY Jets). Keep in mind, next week the Hoosiers hit the road to play a mediocre Iowa team and have a bad Minnesota team at home. Could it be? 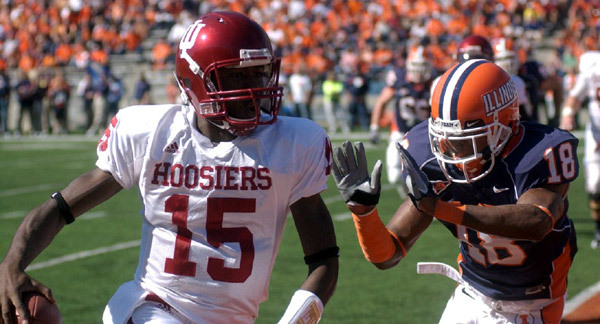 Could Indiana finish the first half of the season undefeated???? Terry Hoeppner is looking down very proud right now. *HC Mark Dantonio will celebrate with his team after this victory. Then he'll whisper to himself, "Man...is Notre Dame THIS bad???" No stats for the Irish, they don't have an offense. *The Wolverines are BACK!!! - HAHAHAHAHAHAHAHAHAHA. Seriously, they're not back - Penn State just isn't as good as everyone thinks. Look at their schedule, FIU, Notre Dame and BUFFALO!!!??? The Wolverines will stick to their Notre Dame game plan. GIVE THE BALL TO MIKE HART! 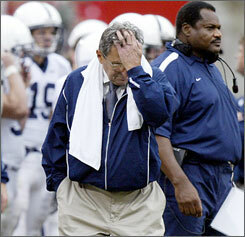 Remember, the Wolverines have won the last 8 games versus the Penn State Joe-PA's. *An apology is in order to the Ohio State Buckeyes. I said they would lose to Washington last week and Jim Tressel's guys made me look like an idiot (it's not that hard). Brandon Saine and Chris Wells combined for over 200 yards against the Huskies and I expect more of the same against a Wildcat team that's still in shock it lost to Duke. *I'm not fading on my pick for Wisconsin to make it to the national championship game. I still think the Badgers will finish the year undefeated and the big four (USC, LSU, Florida and OU) will lose a game. The Badgers are playing so-so lately and they need to show up and prove to the poll voters that they are a top ten team. That won't happen this week, but HC Bret Bielema will get another win. His record at Wisconsin is an amazing 16-1. *I didn't see the Boilermakers coming. This program is on the up-and-up and HC Joe Tiller is the reason. He doesn't get any attention and is hidden in West Lafayette. QB Curtis Painter is the real deal and may play on Sundays - with the route he's on. Ladies and Gentleman, we may be looking at a 10-2 Purdue squad (check out their schedule!). MAC CONFERENCE: 9-2 last week, 22-11 overall in this league. *Not yet Temple, not yet. *This will be a great "Wagon Wheel Game!" Akron has lost two in a row, while Kent State is playing really well. So why am I picking Akron? The Zips have the historical edge in this series. Akron is 7-1 at home versus their instate rival since 1999. They know how to beat these guys and they'll do it again this weekend thanks to the change at quarterback. Carlton Jackson is a better fit for the Zips offense. *Tough game to pick. The Bobcats are good at home under Frank Solich and Wyoming is fresh off a road loss against Boise State. The Cowboys are having a stellar season and may finish 9-3. QB Karsten Sween took two steps back the last two weeks and needs to bounce back for a 9 win season to become a reality. *Dan LeVevour is a really good quarterback. His completion percentage is solid (60%) and his ability to manage the game is impressive for just a sophomore. CMU is putting a ton on his plate and he's answering the call. In this game, he explodes against a decent NDSU club (2-0) and reminds folks in the MAC why the Chippewas were 10-4 in 2006. *After shocking the world (me) and beating Northern Illinois, EMU will enjoy its' first winning streak since 2005! *About as ugly as a college football gets here folks. *For the first time ever, I'm picking Michigan, Eastern Michigan, Western Michigan and Central Michigan to all win on the same weekend!!! !